I listen to Curtis Sliwa on the radio in the afternoon. I listen to Curtis for several reasons. First, he grew up in Canarsie at the same time I did and went to my high school. He makes me feel nostalgic with his Brooklyn accent and his stories about that time. Second, I can’t help but picture him as a young Guardian Angle in his red beret and jacket keeping my friends and me safe on the IRT subway line. And lastly, he’s so controversial and opinionated now, I get a good laugh driving home after a long day. Today he and his co-host were ranting endlessly and pointlessly about President Trump and his penchant for eating high octane, high fat, fast-food. They went through the litany of favorites of theirs and the President’s. McDonald’s burgers and fries; Taco Bell’s burritos, and of course, a bucket of fried chicken. I started wondering, what is the Jewish example of fast food? Certainly we have our share of greasy, high fat, high carbohydrate food…like everything. But fast? We can’t run in somewhere and grab a bucket of matzo balls, or tub of brisket with egg noodles. I thought hard. I asked my husband when I got home. He suggested blintzes. No, I insisted, you have to smear those with sour cream and eat at least three, seated so you can cut them and scrape the plate. 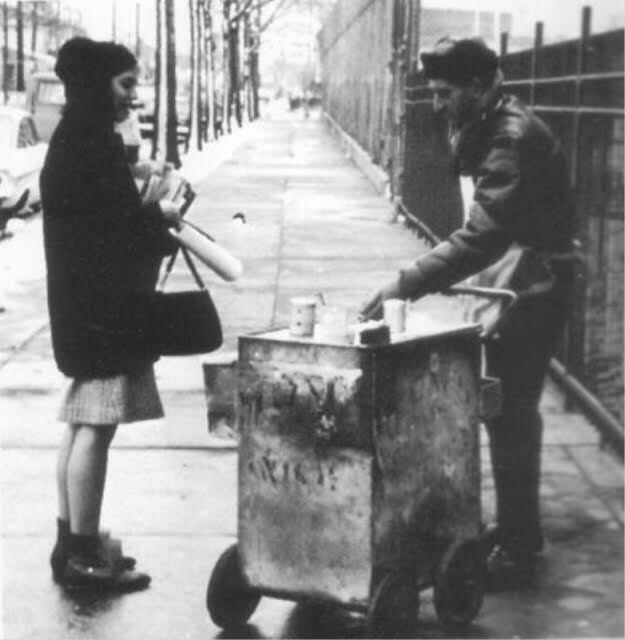 We used to have the “knish man,” an old Russian that looked more like a derelict than a businessman, who had a heated cart on the corner near my school. His business thrived as kids got out of school on split dismissal sessions and he ran his cart up and down the avenue serving his hot knishes in their white waxy scarves. That was our fast food. He was one guy with one cart. It never went global. Nathan’s had the corner on hot dogs, but even though we do like to serve the little “pigs in a blanket” I don’t think that could be considered an authentic Ashkenazi delicacy. Anyone reading this, let me know if you get an idea. We’ll open up the first kosher fast food drive thru. Gefilte fish, anyone?